Student of Giulio Gabbiani and Giuseppe Mangione. After the Trombone Diploma in 1985 (18 years old) he had lessons and Masterclass with Vinko Globokar, William Cramer, Arnold Jacobs, Edward Kleinhammer, Charles Vernon, Frank Crisafulli, Rex Martin, Abbie Conant and Joseph Alessi. He won auditions in O.S.E.R. “A. Toscanini”, the E.C.Y.O. (1988); Teatro San Carlo in Napoli, Teatro dell’Opera in Roma, Teatro alla Scala, Teatro Comunale di Firenze “Maggio Musicale Fiorentino”, Bavarian State Opera, Orchestra dell’Accademia Nazionale di Santa Cecilia in Roma (1st Trombone from June 2003). He played under C. Abbado, L. Maazel, M. W. Chung, C. M. Giulini, Z. Mehta, G. Pretre, R. Muti, S. Bychkov, C. Scimone, W. Sawallisch, G. Sinopoli, A. Pappano. In 2002 Andrea Conti recorded the Nino Rota Trombone Concerto for Chandos. 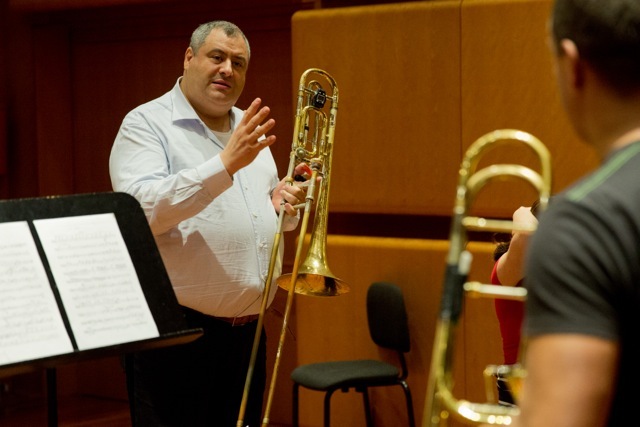 From April 2008 he is the Trombone Teacher in the University School of Music at Conservatorio della Svizzera Italiana in Lugano, Switzerland.